That's one small step for Ryan Gosling...one giant leap for Damien Chazelle, the director of Whiplash and La La Land. Here's to the ones who dream, indeed. 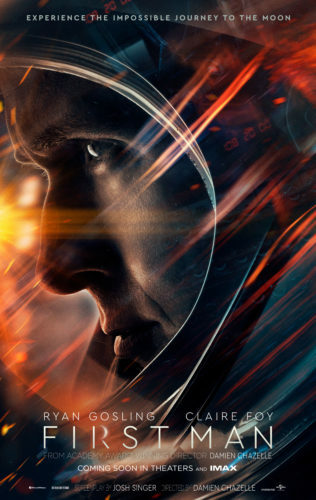 Based on a Neil Armstrong biography by James R. Hansen, First Man looks like a much more intimate, tense take than a traditional epic like The Right Stuff. Hell, the trailer alone might make you doubt Armstrong will make it out alive, even though we know for a fact that he did. That's what happens when a director who can make jazz drumming feel like a life and death issue gets to take on an actual life and death adventure. Familiar faces also crop up playing...other familiar faces. Ant-Man villain Corey Stoll is Buzz Aldrin. Shea Wigham is Gus Grissom. Pablo Schreiber is Jim Lovell, famously played by Tom Hanks in Apollo 13. And Jason Clarke is Ed White, the first American to walk in space. Claire Foy costars as Janet Shearon, Armstrong's first wife...and by the looks of things so far, we're going to see exactly why there was a second. Gosling seems like a solid fit for the reluctant American hero who mostly refused to sign autographs or profit from his image, let alone allow others to do so. Maybe it's just the roles he plays, but Gosling has perfected that "reluctant celebrity" vibe, despite saving jazz, liberating replicants, and spawning a thousand "hey girl..." memes. This is no giant leap for him, except literally, because it will be playing in Imax. Did this trailer have the right stuff for you? Tell us about it in comments. Here's one for Keanu Reeves in Siberia. Here's Halloween, which ignores all prior sequels. And this one is for Bad Times at the El Royale, from the director of The Cabin in the Woods.